On the lower northeastern slope of the Horns of Hattin is a Druze holy site commemorating Nabi Shu'ayb (="the prophet Shuayb" = Jethro). The identification of Shuayb with Jethro, the father-in-law of Moses is a Muslim and Druze tradition. This is one of 4 or 5 places where Shuayb is said to be buried. 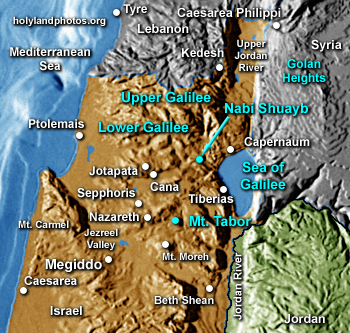 The main tomb is in Jordan and there are several candidates in Sinai. Since 1948 this shrine has been under Druze control (= holy property [wakf]). It was rebuilt in the late 20th century and is a place of pilgrimage for Israeli Druze. On April 25th, the Druze community has an annual meeting (celebration) here. Usually new Druze soldiers in the Israeli army swear loyalty to the state at this site.